Did I mention these chewy bites are plant-based? Chocolate chip cookies that don’t taste one bit vegan. You're welcome! In a large bowl whisk together the coconut oil, brown sugar, and vanilla, beating until well combined. Add in the coconut milk and applesauce and whisk until well combined; set aside. In a separate bowl combine the flour, baking soda, and salt; whisk well to combine. Add the dry ingredients into the wet mixture and, using a wooden spoon or very sturdy spatula, stir until ingredients are combined. The batter will be very thick! 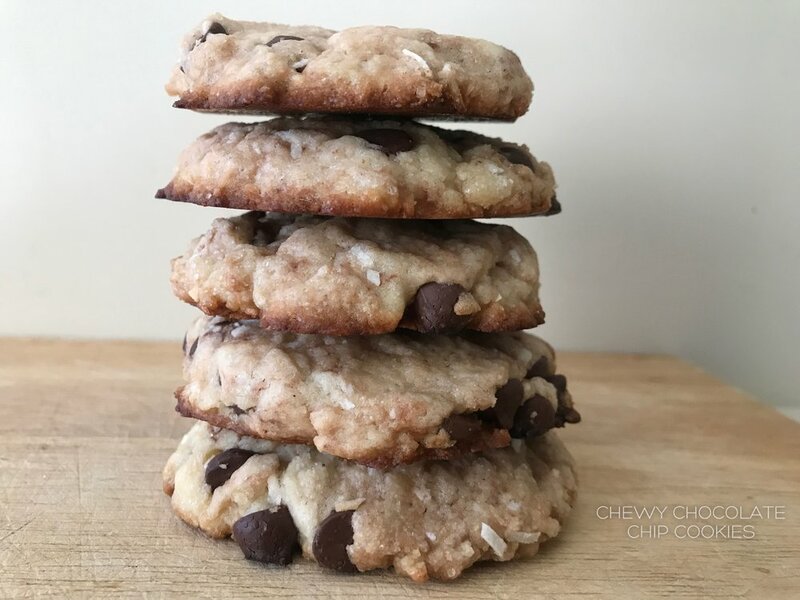 Fold in the chocolate chips and the shredded coconut. Scoop medium sized mounds of dough onto the prepared cookie sheet, leaving a few inches between each cookies for spreading. Bake for 9 to 10 minutes, or until the edges are golden and the centers have set. Cool cookies on the baking sheet for 15 minutes before transferring them to a cooling rack. If the dough appears too sticky, add a little more flour, one tablespoon at a time; if the dough appears too dry, add a tablespoon of coconut milk. Let me know how your cookies turned out! Don’t forget to snap a pic and tag #tatianaxsarah on Instagram!